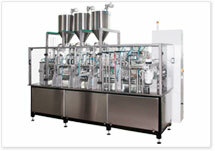 The RS is Fully Automatic rotary Filling and Sealing Machine based on digital mechanical, combined with pneumatic assemblies. 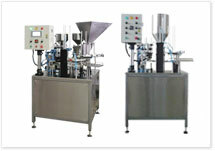 The RS filling and sealing machines are suitable for packaging a wide range of liquid, paste, granulated and powdered products into pre-formed containers of various size and shapes. 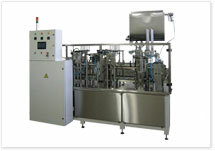 The SDX filling and sealing machines are suitable for packaging a wide range of liquid, paste, granulated and powdered products into pre-formed containers of various size and shapes. This packaging machine can be used for dairy products, salads, dressings, desserts, dry soups, frozen dishes, cosmetics and much more.